[Today on February 15 on The Truthergirls Radio show, I will be talking to Ed Chiarini who will present some absolutely shocking and astounding evidence that Jared Lee Loughner may not only have not shot Gabrielle Giffords on anyone else, but that he may not even exist! This is one of the images of ‘Jared Lee Loughner’ that were circulated on the news shortly after the shooting. Notice the differences in the lips and mouth area before photoshopping. In the image taken from the mugshot, the upper lip is larger in proportion to the lower lip, when compared to the black and white image. In the B&W pic, the bridge of the nose is smaller, and the area between the tip of nose and upper lip is longer. 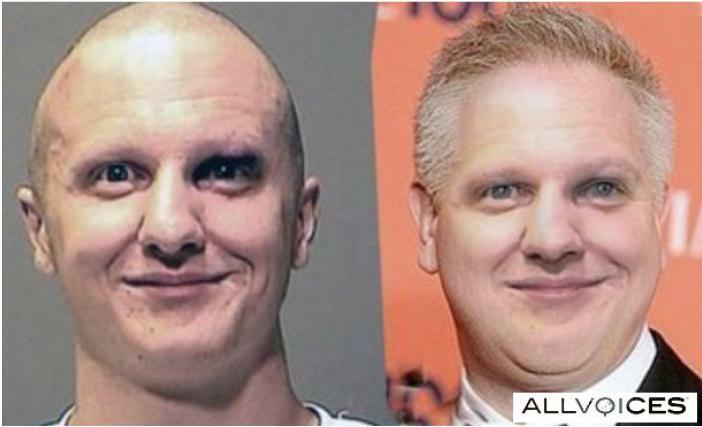 The shadows in the mugshot match those of ther picture of Glenn beck perfectly, especially around the eyes. This cannot be a coincidence! The slightest change in lighting or position changes the shadows on a face. As someone who has a BFA and specialized in portraiture, I can tell you that the shadows are a giveaway that something strange is going on here.